Earlier this week, it was reported that several people in Horethuduwa, Panadura, sought medical treatment for ant-bites. Upon information received, Medical Research Institute (MRI) Director, Dr Anil Samaranayake dispatched a team to investigate the matter. He said samples of this particular ant responsible for the more-than-painful bites, has been collected and brought to the MRI lab for further investigations. These ants have strong jaws and their bite can bring upon allergic reactions to certain people, warns Dr Samaranayake. However, these ants bite only when agitated, and there is no need to panic, he added. Investigating the images of the ant, Sri Lanka’s foremost ant expert – Kelaniya University’s Prof. Sriyani Dias, identified it as a ‘Hathpolaya’ (Tetraponera rufonigra). This ant usually lives in trees and hence is an arboreal ant. The Hathpolaya’s body has a bit of colour, and is also known as ‘Arboreal Bicoloured Ant’. It is a predator that lives on insects, and is larger than normal ants, growing up to 12-15mm, exceeding the size of a ‘kadiya’. Prof. Dias also recalls a ‘Hathpolaya’ infestation in Matara, in 2010. Suddenly, from nowhere, these ants started to appear in several places. Investigations revealed that several large trees in the area had been felled, dispersing large ‘Hathpolaya’ colonies that had been ‘resident’ in these trees. The Panadura incident too could be for similar reasons, thinks the ant expert. The number of Ant species found in Sri Lanka is subject to change, as scientists split new species into one and merge the existing species to single ones. 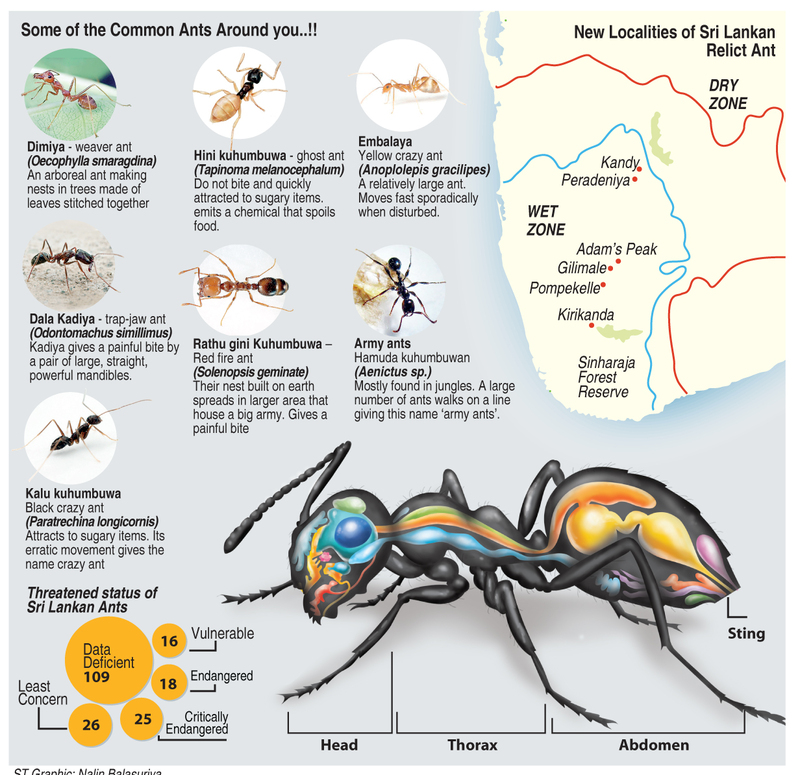 According to the National Red List of 2012, Sri Lanka is home to 205 ant species. The ‘Hathpolaya’ is categorised under ‘Least Concerned’ which means it is not a threatened species. In 2010, the Sunday Times reported the death of a woman due to a ‘Dala Kadiya’’-bite. But, can an ant’s bite be fatal? Experts say people react to insect stings differently, where some develop allergies that could lead to severe conditions. “It is like certain people being subject to allergies reactions after consuming pineapple or prawns”. The age and how nourished/susceptible the body is due to other inadequacies within, are contributory factors to an allergy becoming fatal. “Otherwise, Sri Lanka’s ants are usually not the kind that cause fatalities. They don’t chase and attack when provoked, like bees or wasps,” insists Prof. Dias. Symptoms of a serious allergic reaction, or anaphylaxis, include itching, hives, flushing of the skin, tingling or itching inside the mouth, hoarseness, swelling of the tongue or in your throat and narrowing of the airways which causes difficulty in breathing and swallowing, dizziness, fainting, and nausea or vomiting. can be fatal. These types of reactions usually occur within minutes of the sting, but have been known to be delayed for up to 24 hours. If you are bitten by an ant and are subject to itching and hives or welts on the skin other than around the bite, seek expert medical attention immediately. They are a household nuisance and the sight of lines of ants marching towards food lying about can drive one crazy. But researchers from Peradeniya University studying a group of ants are excited by their discovery. 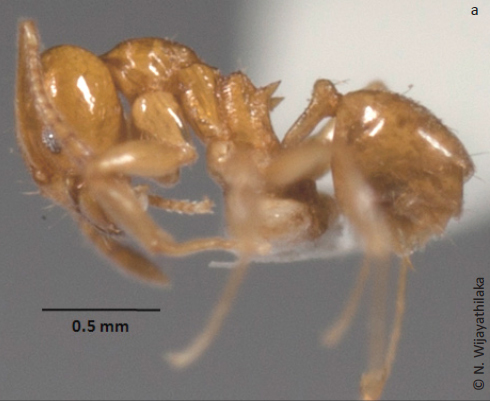 The cause of the excitement was the existence of the rare endemic Sri Lankan Relict Ant (Aneuretus simoni Emery) among the sample of ants being studied. The Sri Lanka Relict Ant may be one of the tiniest members of Sri Lanka’s unique biodiversity but it has a big reputation. As its name implies, a ‘relict species’ is a surviving species of an otherwise extinct group of organisms. The Sri Lanka Relict Ant is the only living species of the Genus Aneuretus (genus is a scientific grouping of species that have common characteristics). This tiny creature has therefore grabbed the attention of entomologists around the world including that of prof. Edward O. Wilson, known as the father of biodiversity. He had even come to Sri Lanka to study this ant a few decades ago. The latest finding was made by young researcher Nuwan Karunarathna who is doing his undergraduate studies under Dr. Inoka Karunaratne of the University of Peradeniya. Nuwan’s research involved analysing the diversity of ant species in two forests in the Knuckles range. This resulted in discovering 48 species of ants including the Relict Ant from the Moraella lowland rain forest near Panwila, and 35 species from the Rambukoluwa semi evergreen forest. This is also the first time the ant has been recorded in the Intermediate Zone according to the paper authored by Nuwan and Dr. Karunaratne and published in last month’s prestigious Journal of Threatened Taxa. The Relict Ant nests are found inside rotting and crumbling pieces of wood or in logs fallen on the ground. An ant colony consists of different levels of members of social strata including the queen and workers. According to researchers The Relict Ant colonies have two types of worker ants–major workers and minor workers. Usually an ant colony consists of thousands of worker ants, but in this species, the number of workers is less than hundred. Studies have shown that colonies are composed of 18-106 minor workers and one to three major workers, says Nuwan. Some colonies could also contain more than one queen. Last year, Prof. Sriyani Dias of Kelaniya University too had found the Relict Ant in a forest patch in Kalutara. Prof. Dias who has been studying the etymology of ants in Sri Lanka since 2000 says more research needed to be done. According to the National Red List 2012, the conservation status of 109 ant species – more than half of the known species, were categorised as ‘Data Deficient”. The Relict Ant has been listed as ‘Critically Endangered’ by the International Red List. However, perhaps due to its discovery in a few locations in Sri Lanka, its threatened level has been elevated to ‘Endangered’ in the National Red List published in 2012. The National Red List however has categorised 25 ant species in Sri Lanka as ‘Critically Endangered” with habitat loss being the major threat. According to researchers systematic studies on ants in Sri Lanka were started in 1903. However, it is interesting to note that documenting ant species goes as far back as to the time of the famous British prisoner Robert Knox. In his book ‘An Historical Relation of Ceylon (1681)’ he mentions seeing six ant species in Sri Lanka. “There are ants of several sorts, and some worthy of our remark. First of all there are the ‘coumbias’ a sort of small reddish ants like ours in England” Knox penned. He also mentions Tele-coumbias, Dimbios (dimiya), Coddia (kadiya) and termites.